NASA marked women's history month yesterday (March 16) with a new website devoted to the contributions of women at the space agency and an event to recognize women's role in space history. NASA deputy administrator Lori Garver presided at the event in Washington, which included 200 elementary through high school students. The space agency unveiled its new Women@NASA website, featuring videos of women in NASA careers telling their stories in their own words. "Women have made tremendous contributions to NASA over the years," Garver said. "They've been astronauts, scientists, engineers, program managers and served in many other capacities. We have an obligation to reach out to the next generation and inspire today's girls to pursue science and technology careers. Expanding opportunities in these fields will give perspectives and expertise to win the future." 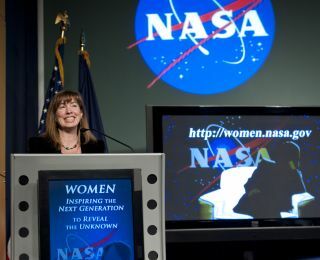 Garver herself is the second woman to hold the post of deputy administrator of NASA — her immediate predecessor was Shana Dale. The deputy administrator post is the highest rank held by a woman yet. Only the space agency's top job – NASA Administrator – is higher. Women began flying in space only two years after the first human spaceflight in history, performed by cosmonaut Yuri Gagarin in 1961. The first female to fly was cosmonaut Valentina Tereshkova, who piloted the Soviet Union's Vostok 6 mission in June 1963, becoming the first woman in space. Twenty years later, the first American woman in space, Sally Ride, flew on the space shuttle Challenger in June 1983. Since then, women have made many more firsts in space, including the first woman spacewalker — Russian Svetlana Savitskaya in 1984 — and the first woman to command the International Space Station, NASA astronaut Peggy Whitson in 2007. Another record was broken in April 2010 when four women — three NASA astronauts and one Japanese astronaut — met on the International Space Station and became the most female spaceflyers in orbit at the same time. In all, 55 women have made the journey to space, out of a total of 520 people who have reached orbit, according to space history and artifacts expert Robert Pearlman, editor of collectSPACE.com. For more on women in space in the past and future, read SPACE.com's Q&A with Smithsonian Museum of Air and Space curator Margaret Weitekamp .